The Merchant must select PAY to view the Payments canvas. To activate, start by selecting the GIFT CARD ACTIVATION button. Enter the desired $ amount being sold, then swipe the card to populate the card/account number. Select OK to complete payment with the customer. 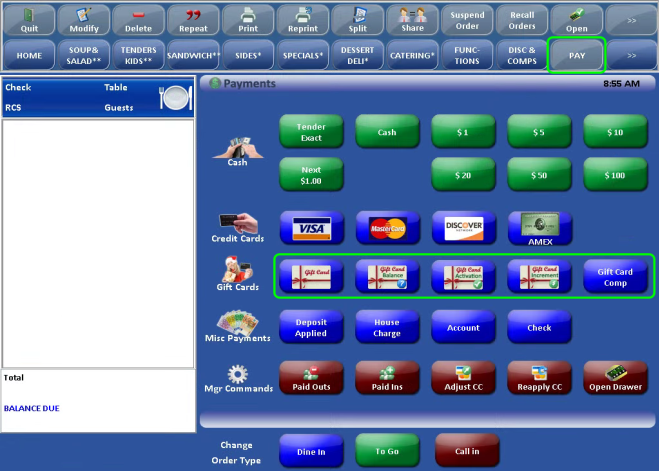 Similar to activating a card, the remaining functions all take similar steps but require selecting a different button. Select GIFT CARD BALANCE, then swipe the card. Select the GIFT CARD INCREMENT button. 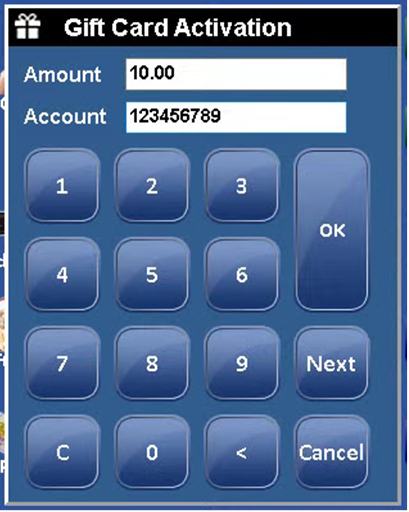 Enter the desired amount, then swipe the card to populate the account number. You can then hit OK to complete payment with the customer. NOTE: The increment option will not function on an unissued card that has never been previously activated/used. Close the customer's bill and proceed to select the PAY section. Select the GIFT CARD button. Swipe the card and enter the $ amount you are redeeming. If a balance is still outstanding, collect payment by alternative tender types (debit/credit/cash).